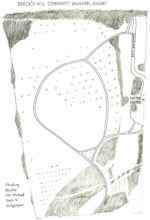 We have recently received new information about the trees at Brock's Hill which is shown below. 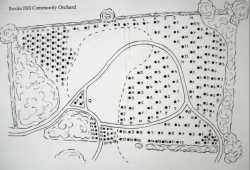 This is an interesting community orchard, with 100+ apple trees and a pleasant visitor's centre. Leicestershire Heritage Apples has taken part in apple events at Brock's Hill in the past, and we are scheduled to attend another on 13 Oct 2013. Unfortunately few of the trees in the orchard are labelled, so although the fruit is excellent, few people know what varieties they are enjoying. Eventually we hope to produce a map showing what is where. To get the ball rolling - if anyone knows the identity of particular trees, we would be pleased to hear from you. Information will be displayed on this page. APPLES: Allington Pippin, Annie Elizabeth, Barnack Beauty, Bramley, Brownlees Russet, Cox Pomona, Dumelow's Seedling, George Cave, Golden Pippin, Newton Wonder. PEAR: Beurre Hardy, Clapps Favourite, Conference, Durondeau. PLUM: Cambridge Gage, Early Rivers, Pershore Yellow Egg. 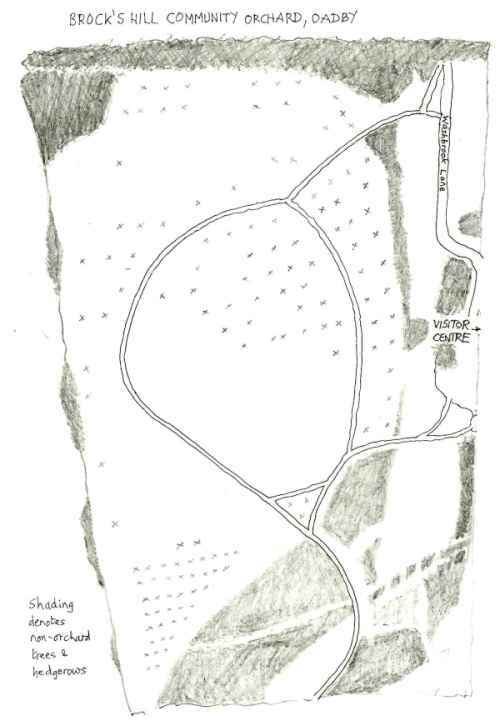 My sketch map of the orchard (and a later one obtained from Brock's Hill) is below. Click the thumbnail for the detail. Mine (on the left) points North. 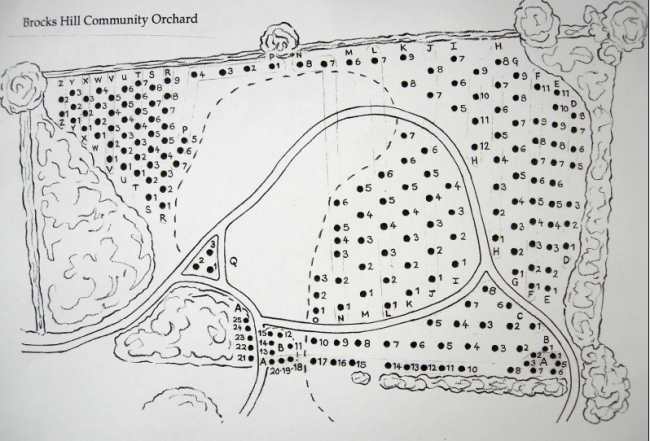 Bottom left hand corner of the orchard on the diagram is mainly pears with some plums slightly higher up. Apples and cherries to the right and middle, including near to the Visitor Centre. My attempt to map this in Feb had to be abandoned; fingers started to freeze! The trees; apples unless stated otherwise. Note that some of the varieties on the original planting list seem to have disappeared.